What can you do to reduce sleep apnea? How can assisted nighttime breathing (CPAP) help? When are mouth guards considered? What can be expected from surgery? A wide variety of treatments are available for the relief of sleep apnea symptoms. They include machines that support breathing during the night, surgery, and other special aids. 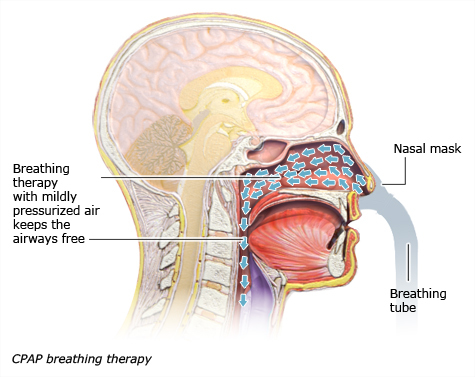 CPAP therapy, which supports breathing using mild air pressure, is the standard treatment. People who have obstructive sleep apnea often snore loudly and have long breathing pauses (apnea) while they are sleeping. This causes them to frequently wake up at night, makes their sleep less restful, and leaves them worn out and tired during the day. The snoring itself is harmless. Avoid stimulants like coffee and tea four to six hours before going to sleep, as well as large meals in the evening, because they can affect your sleep. Do not drink alcohol or smoke in the evening because this can also result in a poor night’s sleep. Alcohol relaxes your throat muscles even more, making sleep apnea worse. Find a quiet, dark, and most importantly comfortable place to sleep with a pleasant temperature. Some sleeping pills and sedatives have many side effects when taken over the long term, and can make sleep apnea worse. These mainly include benzodiazepines. Medications that belong to this group of drugs should be avoided, or only taken for a few days at the lowest dose possible. Other sleeping pills (non-benzodiazepines) probably don’t cause more breathing pauses. Overweight people are more prone to sleep apnea – probably because too much stomach fat makes breathing more difficult. Fat in the neck and throat area narrows the airways even more. Losing weight can have a generally positive effect on the health of people who are very overweight (obese). The sleep apnea also improves as a result, but weight loss alone is rarely enough to make it go away completely. Combining a low-calorie diet with more exercise can help you lose weight. Sleeping on your back can make snoring and breathing pauses worse because your tongue falls further back into your throat. If sleep apnea only occurs while sleeping on your back, you can try sleeping on your side. Some people, for instance, sew a tennis ball onto the back of their pajamas, place a pillow behind their back, or use a bumper belt that is strapped around their chest and worn like a backpack. Sometimes even something as simple as raising the position of your head can help to make breathing easier while lying on your back. Sleeping in a different position doesn't usually make a big enough difference on its own. Although it can lower the number of breathing pauses, studies have shown that changing position didn't help people to feel more awake during the day. CPAP therapy, in which a breathing mask is worn during the night, is generally more effective. There is also a wide range of products such as nasal strips, sprays, and solutions for gargling that are claimed to improve sleep and reduce snoring. But it's not clear whether they help because there’s a lack of conclusive scientific research in this area. CPAP therapy is the most common treatment for obstructive sleep apnea – and is regarded as the standard treatment. CPAP stands for “continuous positive airway pressure.” The therapy involves wearing a breathing mask while sleeping. Depending on the model, the mask covers either both the mouth and nose, or just the nose. Treatment with nasal pillows, where two soft plastic inserts are placed directly inside the nostrils, is also an option. In CPAP therapy, air is blown into the airways using mild air pressure while you are sleeping. The air pressure is created by a small pump which is attached to the mask by a tube. This incoming air keeps the upper airways open, significantly decreasing the number of breathing pauses, increasing blood oxygen levels, and improving the quality of sleep. The snoring problems usually stop, too. APAP – auto-CPAP: Unlike CPAP, APAP doesn’t produce continuous pressure. The pressure of the air delivered is determined by the machine for each breath and adjusted to the person’s breathing. APAP may be an option for people who don’t respond well to the continuous pressure of the CPAP machine or whose sleep apnea only occurs in certain positions. BiPAP – bi-level PAP: BiPAP machines lower the pressure every time you exhale. They are mostly used if it’s difficult to breathe out against the pressure created by CPAP. These machines are also suitable for obstructive lung disease. Studies have shown that CPAP therapy can relieve the symptoms of sleep apnea. Being less tired during the day can improve your mood and your general quality of life. The different types of CPAP machines are about as effective as each other. But CPAP therapy can’t cure obstructive sleep apnea – it can only relieve the symptoms. If the treatment is stopped, the symptoms usually come back right away. The treatment can also help reduce high blood pressure. It's not clear whether CPAP therapy also lowers the risk of heart disease or stroke. Wearing a mask while sleeping takes some getting used to, and some people find CPAP therapy to be unpleasant and restrictive. It can sometimes lead to a blocked nose or a dry throat. In those cases, the air pressure can be adjusted. A humidifier can be attached to more modern CPAP machines. Modern CPAP machines are quiet and hardly disturb your sleep. But some people still find wearing a mask at night so uncomfortable that they stop the therapy altogether. Others put on the mask for only a few hours a night and then hardly benefit from the treatment. Doctors recommend using CPAP machines for at least five hours per night. CPAP therapy is the most effective treatment for sleep apnea. So it may be worth finding ways to make it easier to use the machine. Studies show that some people tend to use it for longer at night and continue therapy if they always have someone to talk to about any problems they encounter during the therapy. They could talk to their doctor, caregivers or other people who have sleep apnea. It is especially important to be able to ask questions during the first few weeks of using the CPAP machine. Psychological support may also be a good idea. If you are having practical problems dealing with the machine or if you just can’t get used to CPAP therapy, it’s a good idea to seek professional advice. It may be worth trying out a different type of mask. If your airways are too dry, using a humidifier might help. Some people who have sleep apnea wear a plastic mouth guard at night. This pulls their lower jaw forward and keeps it there while they sleep. It can stop their tongue from moving back and blocking their airways. Mouth guards can be used to treat milder forms of sleep apnea – or as an alternative for people who have trouble using a CPAP machine. Some people find wearing a mouth guard at night unpleasant, though. It may cause increased flow of saliva, a dry mouth, and feelings of pressure or pain in the jaw joint. Mouth guards are fitted by dentists and orthodontists. In Germany, the costs are usually not covered by health insurance companies. Pre-adjusted mouth guards are also available, but it's a good idea to have a dentist fit them individually. There are different types of surgery to permanently improve breathing in people who have sleep apnea. Most procedures tighten or remove tissue in order to widen the airways. A special procedure known as uvulopalatopharyngoplasty, or UPPP, is used to tighten the uvula (the small piece of tissue that hangs down at the back of the throat) and remove soft tissue from the palate (roof of the mouth). These tissues narrow the airways in people who have sleep apnea. The tonsils may also be removed or reduced in size during this procedure. In a technique known as radiofrequency ablation (RFA), a small probe is used to remove tissue from the palate, the nasal cavity or tonsils. This causes scars that pull at the tissue, tightening it. The palate tissue can also be tightened using a laser. This method (laser-assisted uvulopalatopharyngoplasty or LAUP) is rarely used nowadays, though, not least because it's so painful. In some people, the lower jaw is shifted backward so far that it impairs breathing. In this case the jaw can be moved forward surgically. Whether a particular operation can help will mainly depend on what's causing the constriction of the airways. But it's still not clear how effective the various procedures are and who benefits most from them. There are only very few and very small-scale studies on this. Each of the procedures has risks such as bleeding, pain, or trouble swallowing. The likelihood of side effects depends on the type of surgery. Before any surgical procedure, doctors are required to tell you about any side effects you might have. There are various medications that are claimed to make it easier to breathe at night, for instance by affecting the muscles of the airways or increasing control over breathing. Because no drug has yet been proven to help reduce sleep apnea, medication isn't currently used as part of treatment. But it may be used to treat certain conditions that can make sleep apnea more likely or cause existing sleep apnea to get worse. These medical conditions include things like hay fever or a dust mite allergy. Araghi MH, Chen YF, Jagielski A, Choudhury S, Banerjee D, Hussain S et al. Effectiveness of lifestyle interventions on obstructive sleep apnea (OSA): systematic review and meta-analysis. Sleep 2013; 36(10): 1553-1562, 1562a-1562e. Barnes H, Edwards BA, Joosten SA, Naughton MT, Hamilton GS, Dabscheck E. Positional modification techniques for supine obstructive sleep apnea: A systematic review and meta-analysis. Sleep Med Rev 2017; 36: 107-115. Gao YN, Wu YC, Lin SY, Chang JZ, Tu YK. 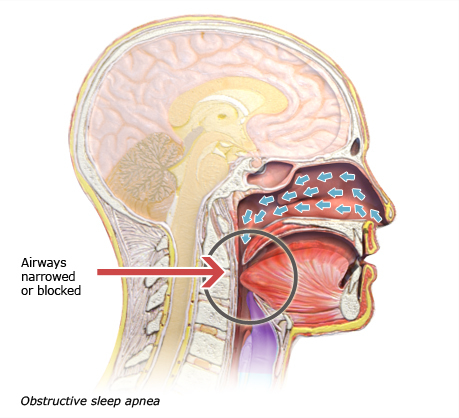 Short-term efficacy of minimally invasive treatments for adult obstructive sleep apnea: A systematic review and network meta-analysis of randomized controlled trials. J Formos Med Assoc 2018 [Epub ahead of print]. Giles TL, Lasserson TJ, Smith BH, White J, Wright J, Cates CJ. Continuous positive airways pressure for obstructive sleep apnoea in adults. Cochrane Database Syst Rev 2006; (3): CD001106. Kim Y, Koo YS, Lee HY, Lee SY. Can Continuous Positive Airway Pressure Reduce the Risk of Stroke in Obstructive Sleep Apnea Patients? A Systematic Review and Meta-Analysis. PLoS One 2016; 11(1): e0146317. Mason M, Welsh EJ, Smith I. Drug therapy for obstructive sleep apnoea in adults. Cochrane Database Syst Rev 2013; (5): CD003002. Smith I, Lasserson TJ. Pressure modification for improving usage of continuous positive airway pressure machines in adults with obstructive sleep apnoea. Cochrane Database Syst Rev 2009; (4): CD003531. Wang X, Zhang Y, Dong Z, Fan J, Nie S, Wei Y. Effect of continuous positive airway pressure on long-term cardiovascular outcomes in patients with coronary artery disease and obstructive sleep apnea: a systematic review and meta-analysis. Respir Res 2018; 19(1): 61. Yu J, Zhou Z, McEvoy RD, Anderson CS, Rodgers A, Perkovic V et al. Association of Positive Airway Pressure With Cardiovascular Events and Death in Adults With Sleep Apnea: A Systematic Review and Meta-analysis. JAMA 2017; 318(2): 156-166.